Koichi Takada Architects’ scope for the National Museum of Qatar in Doha is nearing completion after eight years in the making, after winning an international competition to design the interiors in 2012. Located on a 1.5 million-square-foot site at the south end of Doha’s Corniche, the National Museum of Qatar will be the first monument visible to travellers arriving from the airport. 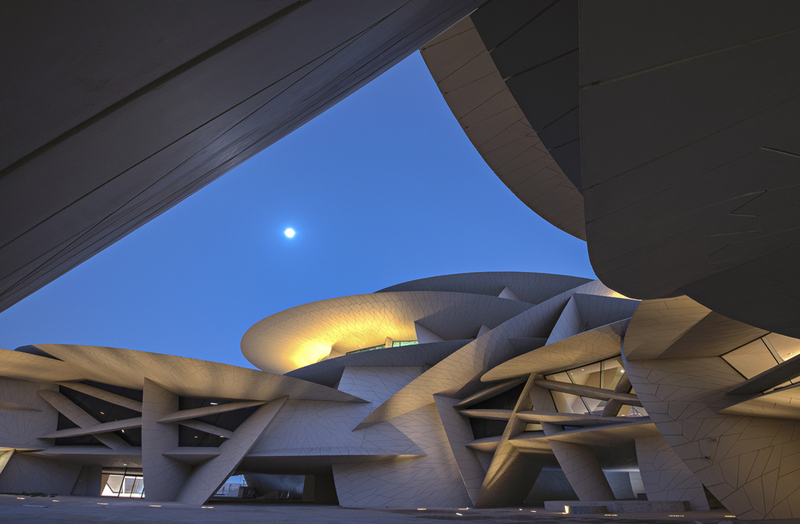 The exterior of the National Museum of Qatar was designed by French architect and Pritzker prize winner, Jean Nouvel. The forms and materials used by Koichi Takada Architects to design the Museum Shops, Desert Rose Café, Cafe 875 and Jiwan Restaurant aim to respect and complement Jean Nouvel’s architecture. Principal architect, Koichi Takada, explains, “Talking to H.E. Sheikha Al Mayassa and to the Qatar Museums Authority (QMA) has opened my eyes to a culturally rich way of life, which has inspired me. They passionately talked about the iconic nature of Dahl Al Misfir (Cave of Light), located in the heart of Qatar, and introduced me to the ritual of Majlis floor dining, a bit like my favourite childhood memory of Japanese tatami floor dining. The interior design concept of ‘desert-scapes’ was curated to create a local cultural experience for visitors while acknowledging Jean Nouvel’s architecture. “The architecture is a representation of the desert rose mineral formation; a connection to nature. Each interior space offers a fragment of the Qatari history, that aims to enhance and fulfil both, a cultural and memorable experience for museum visitors,” explains Takada. 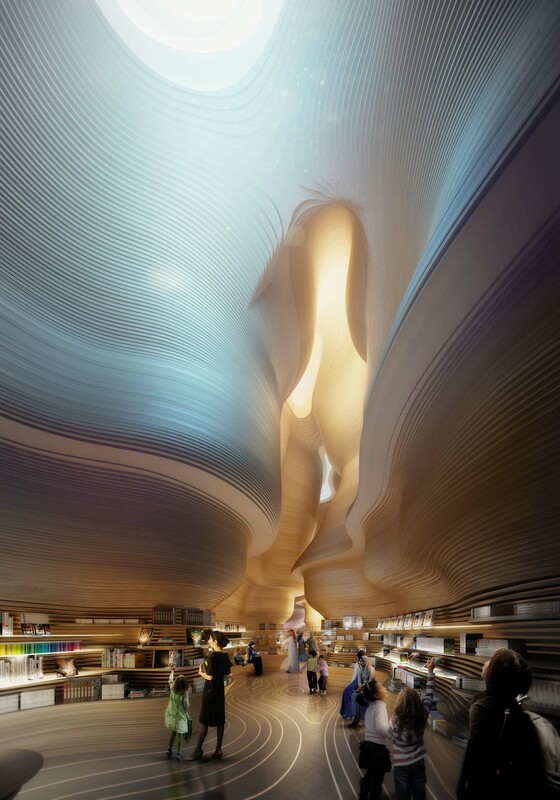 The timber walls of the museum shops were inspired by Dahl Al Misfir, a deep cave in Qatar that gives off a moon-like phosphorescent glow. Koichi Takada Architects used 3D modelling software to design the 40,000 wooden pieces that make up the walls. For Café 875, the architects looked to traditional Qatari gold jewellery, particularly the medallion rings. ‘875’ represents a grade of fineness or purity of gold. The café is located on the mezzanine floor over the main lobby and was designed to be hidden from the sightline so that it does not physically overwhelm the arrival experience intended by Nouvel. The Desert Rose Café, meanwhile is hidden under a large architectural disk, with a low ceiling. 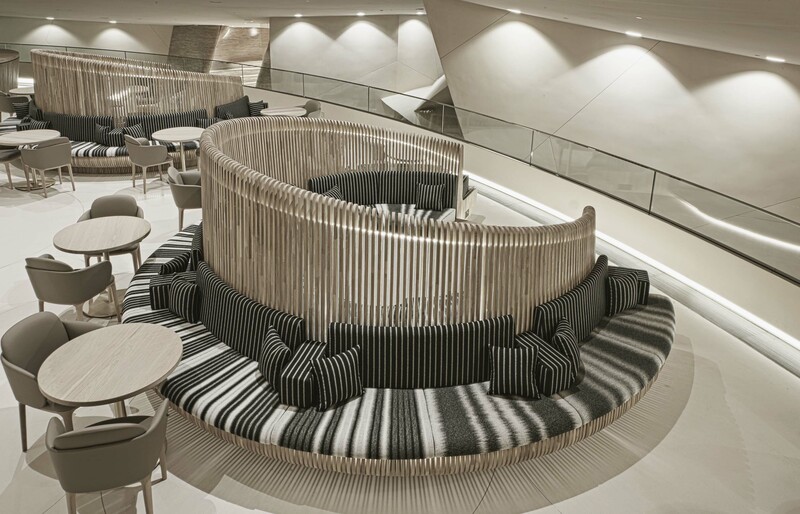 The subtle ambient floor lighting is designed among interlocking discs of the banquette seating, taking away the visitor’s focus from the otherwise compressed nature of the space. The design of the Jiwan Restaurant, located on the fourth floor at the top of the museum, has stunning panoramic views over the aquamarine water of Doha Bay. 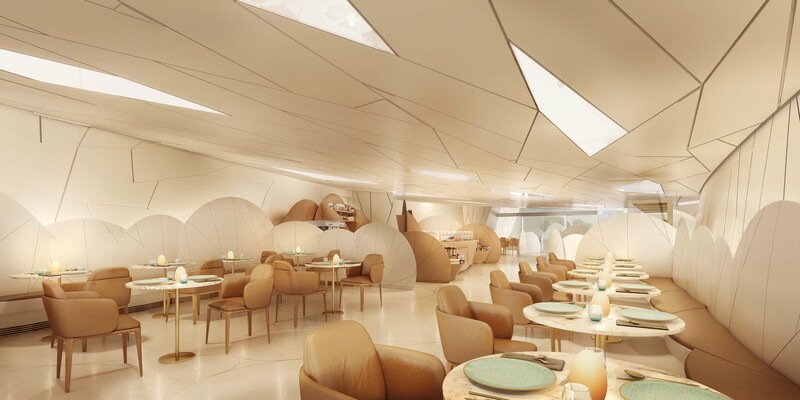 The design of the restaurant embodies Qatar’s unique landscape of the ‘inland sea’ or Khor Al Adaid – desert meets sea. The design draws inspiration from the unique Qatari nature and geography where the sea comes deep into the heart of the desert.